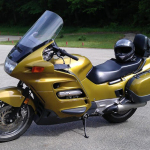 When I first got this bike I had aspirations of my wife and I doing all sorts of long distance rides cross country. I wanted something with decent power, some storage space, and relatively comfortable for two people. It accomplished all of those tasks without any problem. Unfortunately it turns out my wife doesn’t really care for going on rides on the motorcycle and having triplets doesn’t really allow for much time to go on those long rides. So I basically just use the bike for commuting when it’s nice out, so it’s kind of overkill for my needs. It’s still a blast to ride, very comfortable and lots of power. It has 80k miles on it, which may seem high to some folks, but this is basically a two wheeled car, you could double that milage without any worries. It’s been well maintained and I’d choose it any day over a bike with low mileage that was ridden a little initially and then left to rot. So here’s the ad I put up on craigslist. At the moment I’m currently asking $2,700.oo for it. I have a title for it so no going through DMV hell to get it titled. If you’re interested to get at me via the craiglist ad or the contact form on this site.